To Cite: Aghaei H, Kordbacheh P, Kachuei R, Mahmoudi S, Agha Kuchak Afshari S, et al. In vitro Antifungal Susceptibility Testing of Clinical and Environmental Fusarium Isolates in Iran, Arch Clin Infect Dis. 2018 ; 13(2):e58976. doi: 10.5812/archcid.58976. Background: Members of the genus Fusarium are common soil saprophytes and important plant pathogens which also cause a wide spectrum of diseases ranging from onychomycosis to the life - threatening systemic infections. The antifungal susceptibility patterns of Fusarium isolates varies in different species. Objectives: This study was undertaken to investigate the antifungal susceptibility pattern of environmental and clinical Fusarium isolates to conventionally - used azole antifungal drugs in Iran. Methods: A total of 36 Fusarium isolates (16 clinical and 20 environmental) were included in this study. All environmental isolates were obtained from the culture collection of medical mycology laboratory of the School of Public Health at Tehran University of Medical Sciences, Tehran, Iran. Clinical isolates were obtained from patients with onychomycosis and were identified by PCR - sequencing of a fragment of translation elongation factor 1 alpha gene. All clinical and environmental isolates were tested for their in vitro susceptibility to itraconazole (ITC) and voriconazole (VRC) according to the CLSI M38 - A2 standard. Statistical analysis of data was performed using SPSS version 21. Results: The majority of clinical isolates were identified as F. proliferatum (N = 6) followed by F. oxysporum (N = 4), F. solani (N = 3), F. verticillioides (N = 1), F. acutatum (N = 1), and F. thapsinum (N = 1). The lowest minimum inhibitory concentration (MIC) values of ITC was observed for environmental F. verticillioides isolates (N = 5, GM = 13.93 µg/mL). For VRC, the lowest MICs were recorded for environmental F. verticillioides isolates (N = 5, GM = 2.3 µg/mL), and the highest MICs were observed for clinical F. solani isolates (N = 3, GM = 10.08 µg/mL). ITC was inactive against all clinical and the majority of environmental Fusarium isolates (MICs ≥ 16 µg/mL). Significant differences were observed between MICs of ITC and VRC against environmental F. proliferatum and F. verticillioides isolates (P < 0.001 for both). Similarly, the susceptibility of clinical F. proliferatum, F. oxysporum and F. solani isolates to VRC was significantly different (P = 0.023). Conclusions: The resistance pattern in Fusarium isolates is species specific and, therefore, identification at the species level is important for choosing the proper antifungal treatment. Members of the genus Fusarium are ubiquitous common soil saprophytes and important plant pathogens and can cause fusariosis in humans and animals (1, 2). In humans, a range of diseases including superficial and cutaneous infections in healthy individuals, locally invasive or disseminated infections exclusively in immunocompromised patients, and allergic or invasive sinusitis have been reported as caused by Fusarium species (3-5). Onychomycosis is a cutaneous infection which is considered to be a major public health problem globally. According to the literature (6, 7), Fusarium species are common causative agents of non - dermatophyte mould (NDM) onychomycosis. In addition, some species can produce mycotoxins such as zearalenone and fumonisin which have been shown to be associated with diseases in humans (8). Moreover, Fusarium species as plant pathogens cause diseases in agricultural products which result in significant economic loss (9). Moreover, consumption of these contaminated agricultural products can cause serious side effects in humans and animals (9). In recent years, significant contamination of wheat and maize fields, particularly in humid and semi - humid areas of Iran, have been reported (10). Extensive use of azole compounds in agriculture to prevent fungal contamination can develop drug - resistant isolates either in the patient or in the environment. Fusarium species currently show remarkable resistance to most currently-available antifungal agents. Studies have reported different susceptibility patterns within Fusarium species (11-13). Amphotericin B, Voriconazole (VRC), itraconazole (ITC) and various combinations of these have been reported with varying success rates against these species (14, 15). Although, the distribution of Fusarium species varies globally, Fusarium solani, F. oxysporum and F. verticillioides are the most frequent causes of fusariosis (16, 17). Molecular phylogenetic studies have revealed that this genus comprises species complexes and the majority of Fusarium isolates cannot be identified to the species level using traditional morphological methods (4). For this reason, DNA sequence - based molecular tools are increasingly used for accurate and reliable species determination (18). The goal of the present study was to assess the susceptibility pattern of clinical and environmental Fusarium isolates to azole antifungal drugs conventionally used in Iran. In addition, clinical Fusarium isolates collected from patients with onychomycosis were identified using a sequence - based method. A total of 36 Fusarium isolates were included in this study. Among them, 20 environmental isolates (15 F. proliferatum and 5 F. verticillioides isolates) had been previously identified (19) and obtained from the culture collection of medical mycology laboratory of the School of Public Health at Tehran University of Medical Sciences in Tehran, Iran. The remaining 16 clinical isolates were collected from patients with onychomycosis who referred to the medical mycology laboratory of the School of Public Health at Tehran University of Medical Sciences in Tehran, Iran. All the clinical isolates were identified using the molecular method. All 16 clinical isolates were cultured on sabouraud dextrose agar (SDA) medium plates (Merck, Germany) and incubated at 30°C for 2 - 4 days. The total genomic DNA was extracted using the glass - bead phenol chloroform method as described elsewhere (20). PCR was performed to amplify a fragment of translation elongation factor 1 alpha (TEF1-α) gene using the primer pair EF1 (5’-ATGGGTAAGGARGACAAGAC-3’ ) and EF2 (5’-GGARGTACCAGTSATCATGTT-3’). The thermal cycling conditions were as follows: 5 min of initial pre - incubation at 94°C, followed by 35 cycles consisting of denaturation at 94°C for 30 sec, annealing at 58°C for 35 sec, and extension at 72°C for 1 min with a final extension at 72°C for 7 min. The PCR products were electrophoresed on 1% (w/v) agarose gel and then were visualized under an UV illuminator. Afterwards, all PCR products were subjected to sequencing (Macrogen Inc., Korea). For species identification of the isolates, the TEF1 - α sequences were compared to GenBank data using the Basic Local Alignment Search Tool (http://blast.ncbi.nlm.nih.gov/Blast.cgi). Molecular Evolutionary Genetics Analysis (MEGA) software (version 6.0) was used for phylogenetic analysis of the sequences (21). All clinical and environmental isolates were tested for in vitro antifungal susceptibility according to the Clinical and Laboratory Standards Institute (CLSI) broth micro - dilution method (M38 - A2) (22). Stock solutions of the ITC (Sigma - Aldrich, USA) and VRC (Lyka, India) were prepared in DMSO (Sigma - Aldrich, Germany) and diluted using RPMI 1640 (Sigma - Aldrich, USA) medium buffered at pH 7.0 with morpholinepropanesulfonic acid (Sigma - Aldrich, Germany) according to the CLSI M38 - A2. The final concentrations tested ranged from 0.03125 to 16 µg/mL. The density of the conidia suspensions were spectrophotometrically adjusted to a final concentration of 0.4 × 104 to 5 × 104 CFU/mL according to CLSI M38 - A2 (22) and the minimum inhibitory concentration (MIC) values were determined after 48 h of incubation at 35°C. Candida parapsilosis ATCC 22019 and C. krusei ATCC 6258 were used as quality control strains. All tests were performed in duplicate. The study protocol conforms to the ethical guidelines of the 1975 Declaration of Helsinki as reflected in a priori approval by the Tehran University of Medical Sciences’s human research committee (Ethics approval code: IR.TUMS.REC. 1394 - 763). Statistical analysis of data were performed using ANOVA and t-test in SPSS version 21 and P less than 0.05 was considered significant. The TEF1 - α sequences of 16 clinical isolates (F1 - F16) were deposited into GenBank and received accession numbers. According to the results of the sequence analysis, the majority of clinical isolates were identified as F. proliferatum (N = 6) followed by F. oxysporum (N = 4). The detailed results of the molecular identification and the GenBank accession numbers are shown in Table 1. 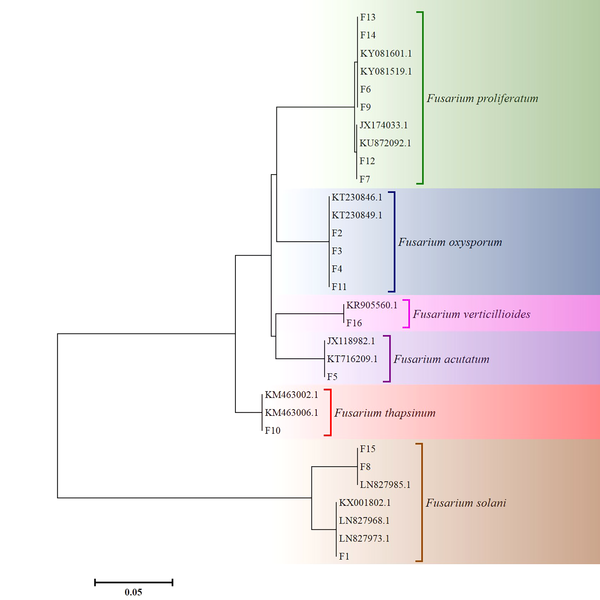 The phylogenetic tree of the 16 clinical Fusarium isolates (F1 - F16) and 15 GenBank sequences based on the partial TEF1 - α gene is shown in Figure 1. The MICs of ITC and VRC for the quality control strains (C. parapsilosis ATCC 22019 and C. krusei ATCC 6258) were within expected ranges (22); therefore, the results of antifungal susceptibility testing were reliable. According to the results of the present study, ITC was inactive against all clinical as well as the majority of environmental Fusarium isolates (MICs ≥ 16 µg/mL). The lowest MICs of ITC was observed for environmental F. verticillioides isolates (N = 5, GM = 13.93 µg/mL). In comparison to ITC, better activity was obtained using VRC against all Fusarium isolates. The lowest MICs were recorded for the environmental F. verticillioides isolates (N = 5, GM = 2.3 µg/mL), and the highest MICs were observed for the clinical F. solani isolates (N = 3, GM = 10.08 µg/mL). Additional data on the antifungal susceptibility results are shown in Table 2. Abbreviations: GM, geometric mean; MIC, minimum inhibitory concentration. According to the results of statistical analysis, the MICs of the environmental F. proliferatum (N = 15) and F. verticillioides (N = 5) isolates for ITC and VRC were significantly different (P < 0.001 for both). Similarly, there were statistically significant differences between the MICs of the clinical F. proliferatum (N = 6), F. oxysporum (N = 4), and F. solani (N = 3) isolates for VRC (P = 0.023). However, the MICs of these species for ITC were not statistically different (P = 0.072). The source of isolates was a factor which affected the results of antifungal susceptibility testing of VRC. In this regard, the MICs of VRC between the environmental and clinical F. proliferatum isolates were significantly different (P = 0.02) while the same condition was not observed for ITC (P = 0.334). Fusarium species are plant pathogens distributed worldwide and cause diseases in many agriculturally important crops. The cause of the damaging effect of their presence as food contaminants is their production of highly toxic secondary metabolites (8, 10). In addition, Fusarium species cause a very wide spectrum of diseases in humans, ranging from superficial infections to disseminated infections with high morbidity and mortality rates (4). Onychomycosis is a common type of cutaneous infection affecting both the fingernails and toenails. Fusarium spp. have been reported frequently as common causative agents of NDM onychomycosis in Iran and other countries (6, 24-26). Although conventional methods such as microscopic examination and culture are available in most laboratories for the diagnosis of onychomycosis, it is difficult to differentiate the Fusarium species on the basis of morphological features. Therefore, molecular methods have been developed for accurate and reliable identification of fungal pathogens to the species level (18, 27). In this study, 16 clinical Fusarium isolates (F1 - F16) were identified using PCR - sequencing of the TEF1 - α gene. The majority of isolates were found to be F. proliferatum and were similar to the environmental strains obtained from the culture collection. These results are indicative of the notable pathogenic potential as well as the increased prevalence of this species in the environment. Among the 16 clinical isolates, six distinct species were identified. Considering the different susceptibility patterns of the various species (11-13), the high diversity of clinical isolates in our study highlights the need for accurate identification of etiologic Fusarium species and antifungal susceptibility testing in order to prescribe efficient treatment. Overall, Fusarium spp. show high MICs to available antifungal agents; hence choosing the optimal treatment strategy is a challenge (13, 27-29). According to the CLSI, filamentous fungi with MIC values of ≤ 8 μg/mL are categorized as “susceptible” (22). Based on this standard, ITC was inactive against all clinical and the majority of environmental Fusarium isolates. The results obtained in this study are in agreement with results of other studies that reported low activity of ITC against Fusarium species (13, 15, 30, 31). On the other hand, in the present study, almost all Fusarium species had high MICs above the published epidemiological cut - off values and were insensitive to ITC with MICs ≥ 16 µg/mL which can lead to treatment failure in patients infected with these strains. Among the new triazoles, VRC is a recommended drug (32) with moderate antifungal activity (MIC values of 1 - 8 μg/mL) depending on the species complex (27, 33). In the present study, VRC showed variable antifungal activity against all tested isolates. Clinical F. proliferatum isolates (N = 6) showed lower MIC values (range: 2 - 8 μg/mL, GM: 4 μg/mL) for VRC when compared to the environmentally obtained isolates (N = 15; range: 2 - 16 μg/mL, GM: 6.65 μg/mL). This is probably due to previous exposure of the environmental isolates to azole compounds in agriculture; however, for this aspect, further studies are required. In this study, two rare species belonging to the F. fujikuroi complex, F. acutatum and F. thapsinum, were identified among the clinical isolates. In general, these two rare species have the potential to act as causative agents of onychomycosis. For instance, F. acutatum has been reported from nail infections as an emerging human opportunist which has thus far been detected in Asia and appears to be restricted to the Middle East (34, 35). In other studies, F. thapsinum, has been reported as causing eumycetoma and has been also isolated from environmental sources (23, 35). Their patterns of in vitro susceptibility to antifungal agents showed high MIC values for ITC (> 16 μg/mL) for both species, which demonstrated resistance of these two rare species. MIC values of VRC for the F. acutatum and F. thapsinum strains were 4 and 2 μg/mL, respectively. Interestingly in this study most clinical isolates of F. solani were resistant to the VRC as well as the ITC. The data was similar to that of previous reports of poor activity of antifungal drugs against the F. solani species complex. This result is indicative of higher resistance of this species in comparison with other species of the genus Fusarium (13, 27, 28). Members of the F. solani species complex are among the most common species present in both clinical and environmental sources. Fusarial infections have emerged in recent decades that are related to high mortality, especially in disseminated infections. In addition, VRC is recommended as the first - line therapy for both superficial and disseminated fusariosis in immunocompromised patients (32). This high drug resistance among Fusarium species means that in vitro analysis of antifungal susceptibility prior to drug administration might be important for choosing the optimal treatment strategy. In conclusion, poor susceptibility of Fusarium isolates to ITC and VRC was observed in this study. The MIC values obtained showed that VRC exhibited significantly better in vitro activity against all clinical and environmental Fusarium isolates. The present antifungal susceptibility profiles, however, shows that differences in antifungal susceptibility exist within the Fusarium species; therefore, accurate identification of Fusarium pathogens and determination of their susceptibility profiles is required. The authors would like to thank the personnel of the medical mycology laboratory of the School of Public Health at Tehran University of Medical Sciences, Tehran, Iran for their assistance with the clinical Fusarium isolates. Authors’ Contribution: Farideh Zaini designed and supervised the study. Parivash Kordbacheh, Mahin Safara, and Reza Kachuei provided administrative and technical support. Hamed Aghaei performed the experiments. Shahram Mahmoudi assisted in molecular identification and interpretation of the results. Setareh Agha Kuchak Afshari drafted the manuscript and the final version was prepared by Farideh Zaini and Shahram Mahmoudi. Funding/Support: Financial support for this study was provided by Tehran University of Medical Sciences, Tehran, Iran (Grant No. 28172). 1. Nelson PE, Dignani MC, Anaissie EJ. Taxonomy, biology, and clinical aspects of Fusarium species. Clin Microbiol Rev. 1994;7(4):479-504. [PubMed: 7834602]. [PubMed Central: PMC358338]. 2. Guarro J. Fusariosis, a complex infection caused by a high diversity of fungal species refractory to treatment. Eur J Clin Microbiol Infect Dis. 2013;32(12):1491-500. doi: 10.1007/s10096-013-1924-7. [PubMed: 23934595]. 3. Nucci M, Anaissie E. Cutaneous infection by Fusarium species in healthy and immunocompromised hosts: implications for diagnosis and management. Clin Infect Dis. 2002;35(8):909-20. doi: 10.1086/342328. [PubMed: 12355377]. 4. Nucci M, Anaissie E. Fusarium infections in immunocompromised patients. Clin Microbiol Rev. 2007;20(4):695-704. doi: 10.1128/CMR.00014-07. [PubMed: 17934079]. [PubMed Central: PMC2176050]. 5. Wickern GM. Fusarium allergic fungal sinusitis. J Allergy Clin Immunol. 1993;92(4):624-5. [PubMed: 8409122]. 6. Gupta AK, Drummond-Main C, Cooper EA, Brintnell W, Piraccini BM, Tosti A. Systematic review of nondermatophyte mold onychomycosis: diagnosis, clinical types, epidemiology, and treatment. J Am Acad Dermatol. 2012;66(3):494-502. doi: 10.1016/j.jaad.2011.02.038. [PubMed: 21820203]. 7. Tosti A, Piraccini BM, Lorenzi S. Onychomycosis caused by nondermatophytic molds: clinical features and response to treatment of 59 cases. J Am Acad Dermatol. 2000;42(2 Pt 1):217-24. doi: 10.1016/S0190-9622(00)90129-4. [PubMed: 10642676]. 8. Fallah B, Zaini F, Daei Ghazvini R, Kachuei R, Kordbacheh P, Safara M, et al. The antagonistic effects of Candida parapsilosis on the growth of Fusarium species and fumonisin production. Curr Med Mycol. 2016;2(1):1-6. doi: 10.18869/acadpub.cmm.2.1.1. [PubMed: 28681005]. [PubMed Central: PMC5490290]. 9. Goswami RS, Kistler HC. Heading for disaster: Fusarium graminearum on cereal crops. Mol Plant Pathol. 2004;5(6):515-25. doi: 10.1111/j.1364-3703.2004.00252.x. [PubMed: 20565626]. 10. Ghiasian SA, Kord-Bacheh P, Rezayat SM, Maghsood AH, Taherkhani H. Mycoflora of Iranian maize harvested in the main production areas in 2000. Mycopathologia. 2004;158(1):113-21. [PubMed: 15487329]. 11. Alastruey-Izquierdo A, Cuenca-Estrella M, Monzon A, Mellado E, Rodriguez-Tudela JL. Antifungal susceptibility profile of clinical Fusarium spp. isolates identified by molecular methods. J Antimicrob Chemother. 2008;61(4):805-9. doi: 10.1093/jac/dkn022. [PubMed: 18263569]. 12. Al-Hatmi AM, van Diepeningen AD, Curfs-Breuker I, de Hoog GS, Meis JF. Specific antifungal susceptibility profiles of opportunists in the Fusarium fujikuroi complex. J Antimicrob Chemother. 2015;70(4):1068-71. doi: 10.1093/jac/dku505. [PubMed: 25538167]. 13. Azor M, Gene J, Cano J, Guarro J. Universal in vitro antifungal resistance of genetic clades of the Fusarium solani species complex. Antimicrob Agents Chemother. 2007;51(4):1500-3. doi: 10.1128/AAC.01618-06. [PubMed: 17220423]. [PubMed Central: PMC1855466]. 14. Araujo R, Oliveira M, Amorim A, Sampaio-Maia B. Unpredictable susceptibility of emerging clinical moulds to tri-azoles: review of the literature and upcoming challenges for mould identification. Eur J Clin Microbiol Infect Dis. 2015;34(7):1289-301. doi: 10.1007/s10096-015-2374-1. [PubMed: 25894985]. 15. Al-Hatmi AM, Meletiadis J, Curfs-Breuker I, Bonifaz A, Meis JF, De Hoog GS. In vitro combinations of natamycin with voriconazole, itraconazole and micafungin against clinical Fusarium strains causing keratitis. J Antimicrob Chemother. 2016;71(4):953-5. doi: 10.1093/jac/dkv421. [PubMed: 26702918]. 16. Scheel CM, Hurst SF, Barreiros G, Akiti T, Nucci M, Balajee SA. Molecular analyses of Fusarium isolates recovered from a cluster of invasive mold infections in a Brazilian hospital. BMC Infect Dis. 2013;13:49. doi: 10.1186/1471-2334-13-49. [PubMed: 23363475]. [PubMed Central: PMC3579725]. 17. Castro Lopez N, Casas C, Sopo L, Rojas A, Del Portillo P, Cepero de Garcia MC, et al. Fusarium species detected in onychomycosis in Colombia. Mycoses. 2009;52(4):350-6. doi: 10.1111/j.1439-0507.2008.01619.x. [PubMed: 18793261]. 18. Balajee SA, Borman AM, Brandt ME, Cano J, Cuenca-Estrella M, Dannaoui E, et al. Sequence-based identification of Aspergillus, fusarium, and mucorales species in the clinical mycology laboratory: where are we and where should we go from here? J Clin Microbiol. 2009;47(4):877-84. doi: 10.1128/JCM.01685-08. [PubMed: 19073865]. [PubMed Central: PMC2668331]. 19. Mohammadi A, Shams-Ghahfarokhi M, Nazarian-Firouzabadi F, Kachuei R, Gholami-Shabani M, Razzaghi-Abyaneh M. Giberella fujikuroi species complex isolated from maize and wheat in Iran: distribution, molecular identification and fumonisin B1 in vitro biosynthesis. J Sci Food Agric. 2016;96(4):1333-40. doi: 10.1002/jsfa.7227. [PubMed: 25903322]. 20. Ahmadi B, Mirhendi H, Makimura K, de Hoog GS, Shidfar MR, Nouripour-Sisakht S, et al. Phylogenetic analysis of dermatophyte species using DNA sequence polymorphism in calmodulin gene. Med Mycol. 2016;54(5):500-14. doi: 10.1093/mmy/myw004. [PubMed: 26868901]. 21. Tamura K, Stecher G, Peterson D, Filipski A, Kumar S. MEGA6: Molecular Evolutionary Genetics Analysis version 6.0. Mol Biol Evol. 2013;30(12):2725-9. doi: 10.1093/molbev/mst197. [PubMed: 24132122]. [PubMed Central: PMC3840312]. 22. Clinical and Laboratory Standards Institute . Reference method for broth dilution antifungal susceptibility testing of filamentous fungi; approved standard. 2nd ed. Wayne, Pa: CLSI; 2008. 23. Al-Hatmi AM, Bonifaz A, Tirado-Sanchez A, Meis JF, de Hoog GS, Ahmed SA. Fusarium species causing eumycetoma: Report of two cases and comprehensive review of the literature. Mycoses. 2017;60(3):204-12. doi: 10.1111/myc.12590. [PubMed: 27928841]. 24. Chadeganipour M, Nilipour S, Ahmadi G. Study of onychomycosis in Isfahan, Iran. Mycoses. 2010;53(2):153-7. doi: 10.1111/j.1439-0507.2008.01679.x. [PubMed: 19298358]. 25. Aghamirian MR, Ghiasian SA. Onychomycosis in Iran: epidemiology, causative agents and clinical features. Nihon Ishinkin Gakkai Zasshi. 2010;51(1):23-9. [PubMed: 20185868]. 26. Hwang SM, Suh MK, Ha GY. Onychomycosis due to nondermatophytic molds. Ann Dermatol. 2012;24(2):175-80. doi: 10.5021/ad.2012.24.2.175. [PubMed: 22577268]. [PubMed Central: PMC3346908]. 27. O'Donnell K, Sutton DA, Fothergill A, McCarthy D, Rinaldi MG, Brandt ME, et al. Molecular phylogenetic diversity, multilocus haplotype nomenclature, and in vitro antifungal resistance within the Fusarium solani species complex. J Clin Microbiol. 2008;46(8):2477-90. doi: 10.1128/JCM.02371-07. [PubMed: 18524963]. [PubMed Central: PMC2519483]. 28. Al-Hatmi AM, Meis JF, de Hoog GS. Fusarium: Molecular Diversity and Intrinsic Drug Resistance. PLoS Pathog. 2016;12(4). e1005464. doi: 10.1371/journal.ppat.1005464. [PubMed: 27054821]. [PubMed Central: PMC4824402]. 29. Azor M, Gene J, Cano J, Sutton DA, Fothergill AW, Rinaldi MG, et al. In vitro antifungal susceptibility and molecular characterization of clinical isolates of Fusarium verticillioides (F. moniliforme) and Fusarium thapsinum. Antimicrob Agents Chemother. 2008;52(6):2228-31. doi: 10.1128/AAC.00176-08. [PubMed: 18391027]. [PubMed Central: PMC2415809]. 30. Paphitou NI, Ostrosky-Zeichner L, Paetznick VL, Rodriguez JR, Chen E, Rex JH. In vitro activities of investigational triazoles against Fusarium species: effects of inoculum size and incubation time on broth microdilution susceptibility test results. Antimicrob Agents Chemother. 2002;46(10):3298-300. [PubMed: 12234865]. [PubMed Central: PMC128790]. 31. Hassan AS, Al-Hatmi AM, Shobana CS, van Diepeningen AD, Kredics L, Vagvolgyi C, et al. Antifungal Susceptibility and Phylogeny of Opportunistic Members of the Genus Fusarium Causing Human Keratomycosis in South India. Med Mycol. 2016;54(3):287-94. doi: 10.1093/mmy/myv105. [PubMed: 26705832]. 32. Tortorano AM, Richardson M, Roilides E, van Diepeningen A, Caira M, Munoz P, et al. ESCMID and ECMM joint guidelines on diagnosis and management of hyalohyphomycosis: Fusarium spp., Scedosporium spp. and others. Clin Microbiol Infect. 2014;20 Suppl 3:27-46. doi: 10.1111/1469-0691.12465. [PubMed: 24548001]. 33. Lortholary O, Obenga G, Biswas P, Caillot D, Chachaty E, Bienvenu AL, et al. International retrospective analysis of 73 cases of invasive fusariosis treated with voriconazole. Antimicrob Agents Chemother. 2010;54(10):4446-50. doi: 10.1128/AAC.00286-10. [PubMed: 20625156]. [PubMed Central: PMC2944599]. 34. Salah H, Al-Hatmi AM, Theelen B, Abukamar M, Hashim S, van Diepeningen AD, et al. Phylogenetic diversity of human pathogenic Fusarium and emergence of uncommon virulent species. J Infect. 2015;71(6):658-66. doi: 10.1016/j.jinf.2015.08.011. [PubMed: 26348828]. 35. Al-Hatmi AM, Hagen F, Menken SB, Meis JF, de Hoog GS. Global molecular epidemiology and genetic diversity of Fusarium, a significant emerging group of human opportunists from 1958 to 2015. Emerg Microbes Infect. 2016;5(12). e124. doi: 10.1038/emi.2016.126. [PubMed: 27924809]. [PubMed Central: PMC5180370].